"Black levels and contrast are excellent on the MU8000"
The MU9000 model and Q7F model are the 1st and 2nd tier Samsung models above the MU8500. 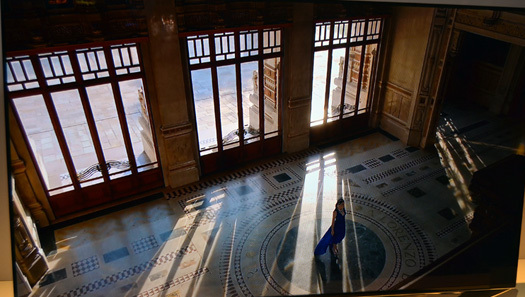 Those two models have a wider color gamut for HDR viewing, and some other advantages like better local dimming and better glare reduction filters in the panel. Other than that the MU8500 has very similar performance. The MU8500 is appealing to those that like the nuanced look of a curved screen. Though we have never believed that it improves the performance of the TV, it's just a matter of taste as to whether to go with a flat or curved screen. This year’s MU8500 series TVs from Samsung are receiving another verbal makeover. Samsung, the ever vigilant master of sleight of term has new appellations, handles, and sobriquets by which to call their visual magic. Some might call it eyewash, because the features are pretty much the same. The new ones for this years models are 4K Color Drive Extreme, 4K HDR Extreme, with a UHD Remastering Engine. All these names basically describe the chip sets used to sharpen color, contrast, and image quality. They provide a slight improvement to last year's KS model in picture quality. Though there are inherent weaknesses with Edge-Lit LED lighting, Samsung has some of the brightest LEDs in the market. The 8-Series passed the test on the new UHD Alliance brightness standard of at least 1000 nits last year and again this year. The powerful LEDs really give the MU8500 a step up in terms of contrast due to those peak whites. It shows up in light flow through on the screen. You will notice this standout feature when viewing onscreen scenes with natural light coming into rooms. Also with onscreen in room lighting. Contrast is also very strong with these SUHD (now called Premium UHD) Samsung TVs with deep black levels. The MU8500 can get brighter than OLED TVs. Samsung's term for the (“local”) dimming feature in the 8-series is Precision Black. Local dimming can offer some increased precision regarding contrast, color, and detail levels needed for each part of the screen to coordinate and excellent overall image. Since the dimming mechanism on the MU8500 is from the edges, we cant really call it true local dimming – a term that describes a TVs ability to brighten or darken specific areas of the screen independently from one another. This feature is effectively supposed to increase contrast in various areas of the picture. In the MU8500, it at times darkens the screen a lot, especially on the higher settings. Unfortunately, the edge lit LED backlight is a major hindrance to good local dimming. Edge Lit dimming has never been one of the best features to me. I like the full boat full-array micro dimming much better which has a major impact on contrast. The manipulation of the edge lighting as in the MU8500 to my eyes only marginally impacts contrast in the picture and is not much of an improvement. I recommend tuning the setting to low for this feature. The big focus TV feature for 20172018 is again HDR (High Dynamic Range). HDR extends the range that a pixel in an LCD TV can show. This applies to the brightness and luminosity of images. Contrast is enhanced by increased brightness rather than deeper blacks. Rather than just increase the brightness of the picture overall though, the real purpose of HDR is to increase contrast in various image areas of the picture. It improves the presentation in the brighter parts of the picture and this creates more contrast with surrounding darker parts of the picture. Since picture contrast is one of the primary features in improving perceived depth, HDR is considered a major picture quality improvement even though it may not increase the overall contrast of the panel a lot. Bright colors receive enhanced purity. A good HDR image will show better shadow detail, and the scenes that you will notice the most are those with light illuminating images, especially outside sunlight effects, or a room that has sunlight coming in through a window and illuminating parts of the room. This picture quality improvement varies quite a lot with the HDR content being viewed. The MU8500 tested average with HDR. It does not have the widest color gamut and not as wide as the MU9000 and Q7F from Samsung this year. But it gets a passable “B” performance with HDR content. From off center the MU8500 has the normal problems associated with LED backlit, LCD TVs. The curved screen can help a bit depending on where you are looking at the screen. Black levels fade as does color saturation. The 8-series panel's beautiful picture presentation loses a lot of it's luster. Since this is not an IPS panel (in-plane-switching), it suffers more from side angles than that variety, but presents excellent black levels during straight on viewing. This is the tradeoff between a VA panel (the MU8500) and an IPS panel (many LGs). Ever wonder if the picture quality is better on a 4K UHD TV with a standard definition or HD signal pumped into it? The answer is yes ONLY if the TV has a stellar upscaling and conversion technology built in. The MU8500's new UHD remastering engine does a phenomenal job upscaling standard definition and lower resolution content. It analyzes the incoming signal, applies video noise reduction techniques, and scales up the lower resolution signal. Lastly, it enhances the detail which may be the most important bit. Anyway, the end result is that yes, you get a much better picture. I would place the MU8500 as good as any TV we have tested in this area. This is one of the big differences of the very top end TVs. Better processing produces a great picture quality even with streaming video signals. Digital Clean View is a feature that works well to clean up image edges and create a sharper looking picture from poorer resolution content source. You can turn the feature off for good HD or 4K content. Alright, here are the particulars on what makes a “Premium UHD TV”. First, there is a new color system used called DCI P3 which has a wider color gamut or spectrum or pallet – call it what you will it's a bigger range of colors, more Crayolas in the box. That color is dispersed and enhanced further by Quantum Dot film which is placed in one of the layers of the panel. The combination of the two does improve the color. It comes across more refined, cleaner and more defined than the previous 4K TVs. To me, it's a 10% improvement in color representation. Next, the SUHD lineup has a brighter backlight which is capable of hitting 1000 nits at peak brightness and produce deeper blacks as well, though this is more difficult to discern. Last, all Premium UHD TVs in Samsung's lineup have the proprietary Samsung developed Tizen operating system for Smart TV though that's not part of what differentiates an Premium UHD TV. Premium UHD is all about those upgraded picture quality features, especially the wider color gamut. This figure represents an enhanced Hz rate for the 120Hz panel. By manipulating the powerful LEDs Samsung is able to produce an “effectively” faster refresh rate. The input lag is excellent at around 24ms when the TV is in Game Mode. The MU8500 does a great job with fast motion images on screen. Good for sports and gaming and also has no image retention issues for gamers. The Samsung MU8500 comes with only 5 preset picture modes which are Movie, Natural, Standard, Vivid, and then the separate Game mode. Obviously, Game mode is your choice to cut down on input lag from games. Quick Calibration: The following settings are for a medium to dark room light. Since calibrations can vary among different TVs even from the same model number, we no longer post the advanced 10 point White balance calibration settings. However, TV manufacturers have improved at providing a preset picture setting that is pretty close to D65 out of the box. The settings below will get you close. Try the Warm 2 setting and for a couple days to get used to it. If after a couple days picture images still seems to warm (reddish tones), change it to the Warm 1 mode. Also, if you are viewing in a brighter room environment, you may prefer the Warm 1 mode. Notes: The Backlight setting is the easiest and quickest way to adjust for room light conditions. For brighter rooms move the setting up and darker rooms down. Game Mode may be enabled under Special Viewing Mode. The Digital Clean View mode may be utilized for lower quality and lower resolution content like 480p DVDs, non-HD cable, and streaming TV that is not HD quality. The Auto Motion Plus feature is something that comes as a blessing and a curse. By default it is set to On in all of the preset picture setting modes. You will likely want to turn it off for streaming content, DVDs, Blu-rays, and TV shows. The feature gives you a dreadful “Telenovela Effect”, making images look unrealistic by eliminating too much natural background blur. Turn it off in the Expert Settings menu and everything will be fine again. You'll immediately see judder when you disable it, but your eyes will adjust momentarily. The features does not hurt good quality live sports programming so you may want to use it there. Another experiment you may want to try is using it with poor quality DVDs. It can help the viewing experience there, bringing these old movies to life. Just be familiar with how to s and it won't be a problem. Another possibly acceptable setting is enabling the feature using the Custom setting and using a low value on the De-Blur portion of the setting. 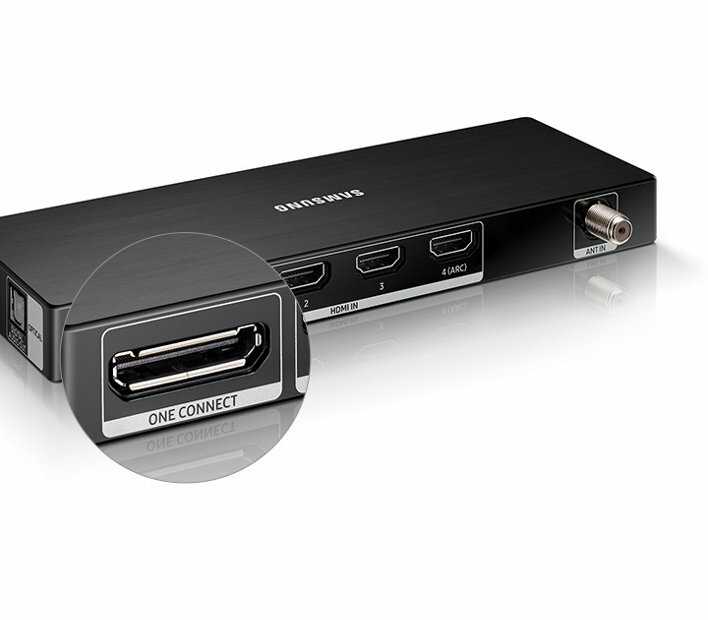 This Samsung developed system is included only on Premium UHDs and up and is much faster and more responsive than previous Samsung Smart TV/Smart Hub menu systems. It's instantaneous response time operation impressed me. Aside from the increased speed it remembers where users are in a program rather than having to fast forward from the beginning like last years models. The Smart Hub menu has also been revamped and upgraded for easier organization of your favorite Program and Apps options. 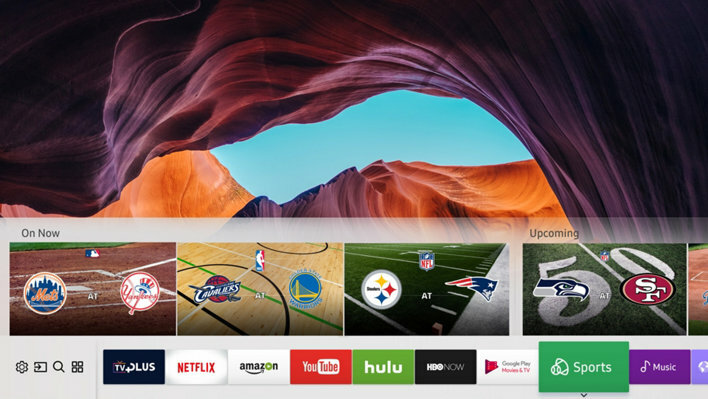 Overall, the Tizen system is pretty strong but not as smooth or interface friendly as the Android TV system included on Sony and Sharp's best models. The Android system also has a little better offerings. "The Tizen operating system is very good. It's fast and well laid out for easy navigation"
The included black touchpad Remote Control is light, and easy to operate whizzing around the Tizen Smart Hub menu system. The voice command feature on the remote works well. Speakers have total 40 watts of audio output, 10w from each speaker and 10w each from 2 subs. In a very large room you might find the 65” model lacking. But the subs do help lay off some of the tininess, and present more full sound. With a TV this nice looking you hate to have to add a bulky unattractive soundbar especially in a modern or minimalist setting, so a decent inbuilt speaker system is necessary. Sound Quality is very average, lacking lustre. The “360” curved design of the MU8500 is very attractive. Samsung has been more thoughtful than most about the way the back of the TV looks (textured), and includes a nifty clutter free cable routing solution in a stand leg. The silver color stand and frame I like a lot – beautiful look. The MU8500 is only 3.9” in depth even with the curve. The included One Connect box also keeps your cables nice and tidy. It can also be upgraded later in the future if needed, without having to replace the whole TV. I have liked the 8-series model for years and this year is no different. 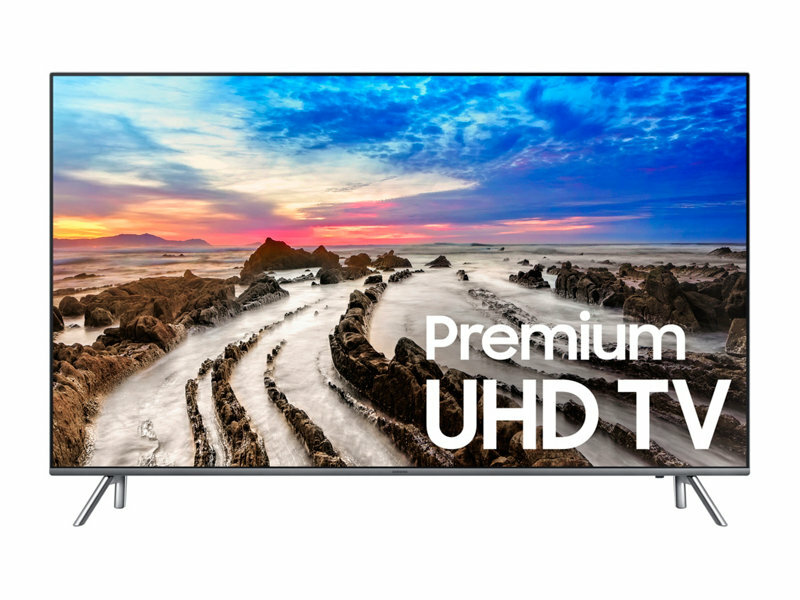 The 55” model price is especially attractive. The TV has great features and picture quality for a very reasonable price. We are raising the value rating to a 90 for this year's 8 series. What is 4K UHD TV Resolution?